→How to start an online store that actually makes you money? Learn How to Start an Online Store and generate revenue from the Internet? An online store is nothing but a website that helps visitors to find, order and pay for products and services. Start an online store in this decade to create a stable revenue online. This is a digital era, and everyone is trying to have some sort of online presence. We can either start a blog, tutorial website or an online store. 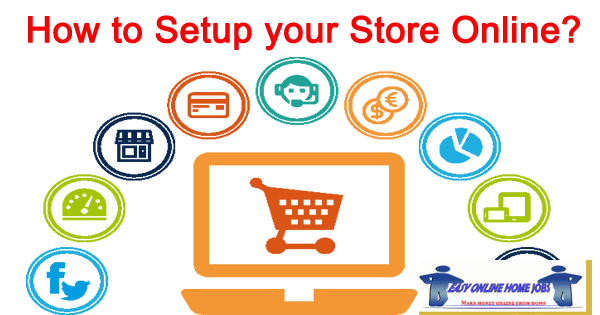 Creating an online store helps us to earn money by simply sitting at home using our laptop or desktop with an internet connection. Today is the perfect time to start an online store because most of the people around the world are shopping online. Everybody prefers online shopping because it is the convenient and the fastest time-saving experience. With the emerge of internet purchasing habits, physical stores are losing its customers day by day. Ultimately all physical store owners are trying to get their online presence by creating websites for them. Online stores are great for both shoppers and business owners. The biggest advantage of starting an online store is that even a small business is able to compete with big companies. And in fact, it is much easier to start an online store than to start a retail business. It is more profitable and there is no need to spend more money on opening an online store. All you need is to have is your own domain, business name, and happy customers to lead a successful online store. How to set up a store? You might have seen many online shopping sites as of today. And as a first step, you need to decide, what product you are going to sell online. There are many products which are on demand and can be sold easily. Also, there are certain products, which cannot be sold with ease. So, based on online demand, list the products that you can sell to get profit. Create a database of manufacturers and dealers of products you are going to sell. To have a successful online store, knowing what product you want to sell is really important. Once you have decided on your niche or product you want to sell, the next step in creating an online store is to choose where to sell. There are many online platforms like Etsy, Amazon, or eBay where you can start an online store to sell your products. These marketplaces introduce your brand to customers and all you have to do is to satisfy the customers. These platforms have higher uptime, unlimited support, great integrations, secure payment process, and customized design options. However, I recommend selling your product on your own website so that you can control your own brand. In order to get your business successful, you need to have a detailed business plan. It includes production cost, marketing strategy, shipping cost, Taxes, Domain and hosting service purchase, Name of business, Logo, Funds Required etc. So, plan all these factors to initiate the business effectively. You should know the pros and cons of online business before entering into it. Choose a domain name that is easy to remember. It should be unique and catchy. Look for the domain names through different registrars until you find the correct name. Find a good web hosting service which has enough space for higher traffic. Choose the hosting service that allows for customization if you are planning for own programming. Finally, design the website either on your own or hire a web designer or freelancer to do it. This feature allows the customer to view your product and make a secure purchase. You need to choose it very cautiously as it will deal with your customers personal and financial details. You need to set up a merchant account so that your customers will be able to pay with credit cards. Though you have decided what product to sell, the journey to success is still far until unless you do market research. This is the place where most of the people will fail. It is easy to start an online store but running successfully is a little trickier. Try to understand your audience, analyze which product is sold frequently, and with whom and reach out with your products. Though this is the slow process, this strategy will help you a lot in identifying the audience. Create awareness about your brand through ads, banners and through social media like facebook, twitter etc. Having Facebook page and the Instagram account will do wonders in short term. Try to analyze your competitors and how they talk to their customers. Follow the idea which makes them successful and if you feel that you can improvise, then implement your idea to do better than your competitors. Watch your competitors for offers and other privileges they provide. Try to provide better offers to your customers to drag them towards you. Logo design cost and other expenses. How to Setup an online store? After doing market research, finding your audience and setting a budget, finally, it is time to set up an online store! Template plays a major role in the online store, as this is the user interface. Recall all the best templates you have seen so far. Try to implement something new and impressive for customers to appeal. Making a right choice is very important, so get a suggestion from your friends after choosing. Better to choose light background in order to highlight your images. Once You have finalized, fix it and go to the next step. Images are the ones, which attracts the users. So in order to impress your customers, you need to use high-quality images. There are a lot of websites that offer free images having high quality such as pixabay.com etc. You can use images with few graphics involved in it. You can use multiple images with scrolling effects, which will look great. Categories help the user to navigate to the exact product they are looking for. You should be able to give your users a great user experience and hence, try to give appropriate categories for your customers to choose from. Refer famous e-commerce websites and try to learn from those sites about organizing the products. Each e-commerce website follows their own style and makes their users feel comfortable with the navigation process. Keep your products in a well structured and organized manner and the user end should look clean and appealing. Plan your products placement and organization. Study different sites to start an online store and place your products accordingly. The product description should be unique and should contain all the necessary details required for the customers to purchase. You should not give a chance to users for a second thought of purchasing the product. Each product should have at least 3 to 4 high-quality photos of the product. The photos should have zoom in feature. You can use a model to use your products to give a visual experience to the user. Once you are done with the template, design, structuring, and organizing things on your online store, test your store yourself. You should pretend you as an end user and purchase a product from your site. This will give you a complete flow of your online store. You can rectify if you find any errors in the complete flow. Also, you should check the payment process as well. Once you are fine with the complete flow and are satisfied, its time to market your store. You can use ads, banners, social media like Facebook and Twitter for creating awareness about your brand. Digital marketing is essential to boost up your rank in google search engine. It enhances your web presence and flourishes your brand name. SEO (Search Engine Optimization) is required to get a great organic traffic to your online store, and it is must optimize your site to get great results. SMM (Social Media Management) is essential to cater all your social media requirement. It includes content curation, paid social media ads etc. SMO (Social Media Optimization ) is required to connect with users worldwide and enhance your social media status to reach more audience and improve your brand names as well. SEM(Search Engine Marketing) is essential for growing your business and attract more customers online. In order to get success in all, we need to have an innovative and effective marketing strategy. Last but not the least, driving traffic to the online store is most important, as this will improve your sales. You can drive traffic through different ways online. You can drive traffic with the help of social media, which will give you effective output. There are many online store builders available online to start an online store very easily without any skills. Shopify is famous because of its features, easy to use interface and has a great support forum with how-to content is a good option for a beginner. It is rated as one of the top online store builders. 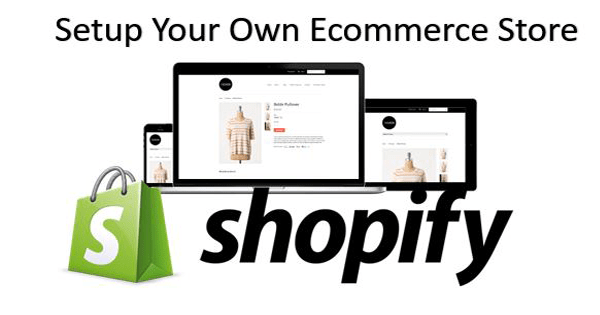 Using Shopify, you will have total control over the design of your online store because you can choose from over a hundred different templates. It has a smart analytics platform, where you can get complete statistics of customers and it also supports the creation of apps that are easy to set up. 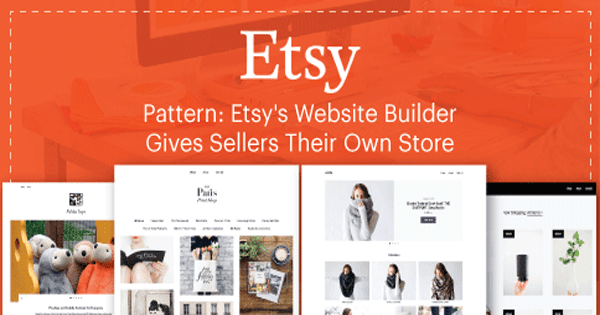 Etsy is one of the easiest ways to start an online store using their one-click setup process. With very few steps of sign up and verification process, you are all set to start selling your products. Etsy is a product-oriented site that has launched a service called pattern, which makes easier for its customer to sell goods. It has highly customizable features and is user-friendly by its nature. Wix is one of the best online store builders for e-commerce business. It allows you to create online stores with highly rich features at the best prices. Wix website builder has drag and drops features, which allows any user to use it in a way they want. Users can come with several features like inventory management, taxation, and shipping cost calculation widgets. You can integrate your social media accounts very easily. Wix has a smart SEO tool incorporated into it, to attract customers and it’s a pretty good choice to start with. 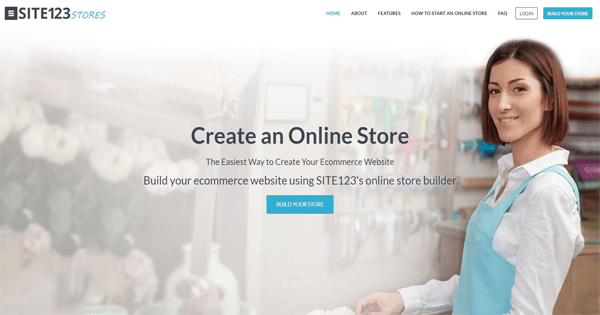 SITE123 help beginners create a beautiful online store or website in simple 3 steps. It allows customers to set up a good looking website or online-store without a need to know the coding part. Even drag and drop is not required. It just requires you to sign up and select a category like fashion, sports etc. Next, SITE123 takes you to the various templates to begin working with. Here, you can choose from different templates, and once chosen, your site is ready to use. The Freshlabs has an integrated platform which is intuitive, user-friendly and widely used by many. 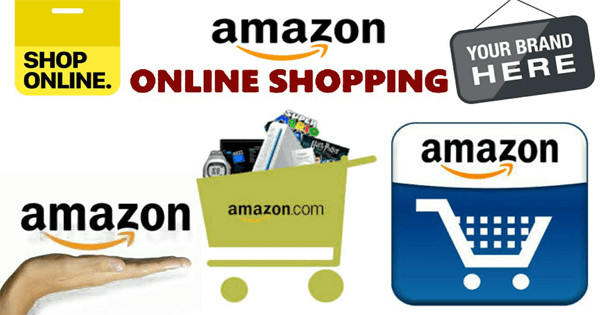 It gives you an attractive storefront and Amazon has an effective 3 step checkout process that helps users to purchase easily. Integrated payment gateways, apps, social media accounts, and high-fi templates give a great platform to work with. As the rent of the physical store is getting higher, the owners have to initiate promotional activities to attract consumers in order to sustain in the competitive market. Many retail clothing store owners have started an online store to increase their profit. Online Drop Shipping is the most efficient method available for you to begin selling hard goods from an Internet retail store. Drop Shipping occurs when a retailer accepts customer orders for products that the retailer does not have an inventory. This retailer forwards the customer’s order to either a manufacturer or a drop shipping wholesaler who keeps an inventory of the product. The manufacturer or the wholesaler ships the product directly to the customer and bills the retailer. The retailer who originally took the order bills the customer at the retail price and records the difference as profit. Here one of the advantages is that, no need to have a separate shipping department. Starting an online course is the best option if you are already in the education field. It requires basic knowledge to start it effectively. Choose the area of education, and assign online tutors who can work dedicatedly. Fix price for the online courses and offer certification for completing the course. The brand name is very essential and hence the promotion of the brand is important to create awareness about the courses offered. If you are good at writing, you are ready to create your own online ebooks store. 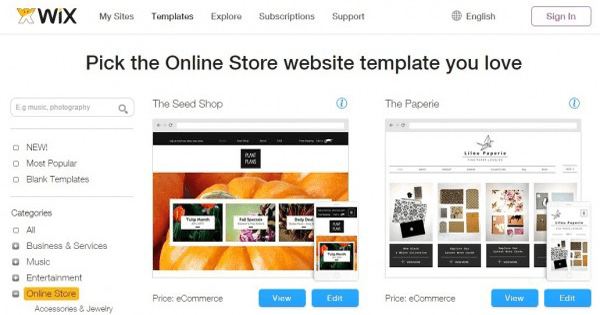 Start an online store using the e-commerce site builder to design your online ebook store. You can upload your ebooks and fix a price for it to sell online and promote it eventually. You can also make other users sell ebooks on your store on a commission basis. This will increase your revenue and give more profit. There are many art stores available online. Art store is specifically for art selling and you can create one on your own. All you have to do is take the images of your art, upload it to the store and fix a price, and finally promote. If customers like your product, they can purchase it. Likewise, other artists can also sell their arts on your online store. These kinds of stores require marketing and a huge number of audiences to get profit out of it. To start an online store, we require a niche and an idea on what to sell. Once decided, we need to create a business name and planning, domain purchasing and hosting services. Choose e-commerce software and create a merchant account. Once done, do market research and analyze your audience. Do budgeting and get ready to build your store. For building, you need to choose a template and images. With unique product description and photos, you can finally test your online store. If everything goes well and good, launch your website and drive traffic to your website with the help of social media. Follow the simple steps to get started with the online store!! !